Antoine Griezmann's double helped Atletico Madrid ease to victory over Rayo Vallecano and keep pace with their rivals at the top of La Liga. The French forward took advantage of slack defending to slot past Tono and then fired in from a Mario Mandzukic header to double the champions' lead. Roberto Trashorras struck back before Manucho's own goal after the break. The win keeps third-placed Atletico four points behind leaders Real Madrid and three behind Barcelona. Diego Simeone's side headed into the match off the back of 1-0 defeat by Barca in the Copa del Rey in midweek. 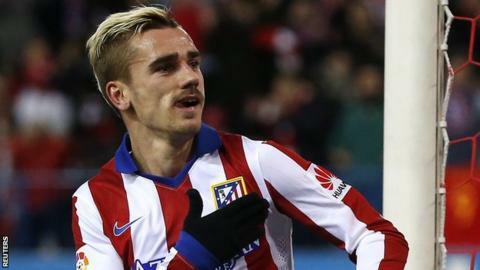 Griezmann was unlucky not to score his first Atletico hat-trick when he struck a post with a difficult chance late on but took his tally to 10 league goals for the season. On loan AC Milan striker Fernando Torres made his sixth appearance since rejoining his boyhood club as a substitute for Mandzukic and squandered a great chance to the score in stoppage time. However, the convincing derby victory over Madrid neighbours Rayo gives Atletico a timely boost ahead of the return leg of their Copa quarter-final against Barca at the Vicente Calderon on Wednesday. Match ends, Atlético de Madrid 3, Rayo Vallecano 1. Second Half ends, Atlético de Madrid 3, Rayo Vallecano 1. Attempt missed. Raúl Baena (Rayo Vallecano) right footed shot from outside the box misses to the left. Raúl Baena (Rayo Vallecano) wins a free kick on the left wing. Attempt saved. Mario Suárez (Atlético de Madrid) right footed shot from outside the box is saved in the centre of the goal. Assisted by Tiago. Hand ball by Zé Castro (Rayo Vallecano). Attempt missed. Zé Castro (Rayo Vallecano) right footed shot from outside the box is high and wide to the right following a corner. Corner, Rayo Vallecano. Conceded by Miranda. Alberto Bueno (Rayo Vallecano) wins a free kick in the defensive half. Antoine Griezmann (Atlético de Madrid) hits the right post with a left footed shot from outside the box. Assisted by Tiago following a fast break. Corner, Rayo Vallecano. Conceded by Guillherme Siqueira. Foul by Alberto Bueno (Rayo Vallecano). Substitution, Rayo Vallecano. Álex Moreno replaces Gaël Kakuta. Javier Aquino (Rayo Vallecano) wins a free kick in the defensive half. Corner, Atlético de Madrid. Conceded by Jorge Morcillo. Attempt missed. Manucho (Rayo Vallecano) header from very close range misses to the left. Assisted by Roberto Trashorras with a cross following a corner. Corner, Rayo Vallecano. Conceded by Giménez. Attempt saved. Alberto Bueno (Rayo Vallecano) right footed shot from the centre of the box is saved in the bottom left corner. Assisted by Roberto Trashorras with a through ball. Attempt missed. Manucho (Rayo Vallecano) left footed shot from outside the box is high and wide to the left. Assisted by Álex Pozuelo following a fast break. Substitution, Rayo Vallecano. Alberto Bueno replaces Mohammed Fatau. Substitution, Atlético de Madrid. Fernando Torres replaces Mario Mandzukic. Manucho (Rayo Vallecano) wins a free kick in the attacking half. Gaël Kakuta (Rayo Vallecano) wins a free kick on the left wing. Foul by Álex Pozuelo (Rayo Vallecano).